It is an obvious fact that one of the most vital reasons for brushing your teeth is to fight off cavities, not to mention to prevent bad breath. The daunting reality is, if not done correctly, brushing your teeth can actually make you more vulnerable to cavities, tooth decay and gum disease. There are a number of common mistakes that we all make every morning and night while brushing our teeth that can damage them and turn the healthy smile upside down. Find out what risks are you taking with your pearly whites and break these habits now! Many of us are guilty of not using the proper technique to brush our teeth. Side-to-side strokes are a big no-no in this case. The enamel is made out of tightly packed, glass-like rods that are extended out toward the surface of the tooth. Brushing side-to-side breaks these brittle rods leading to cracks and weakening of teeth. The ideal way to hold your brush is at a 45-degree angle and brush up and down and in small circles. Concentrate on a few teeth at once, then move on to the next set, continuing from one side to the other, front and back and top. After that, brush away from the gum line to clear all the loosened plaque and bacteria. Rinsing during or after brushing is not effective and will get rid of all the benefits of the toothpaste. It is also similar in case you rinse with mouthwash afterwards. It is recommended to use mouthwash at some other time instead of when your brush or floss. On the bright side, that’s four applications of fluoride per day instead of two. To remove plaque from your teeth, all that is required is gentle brushing. 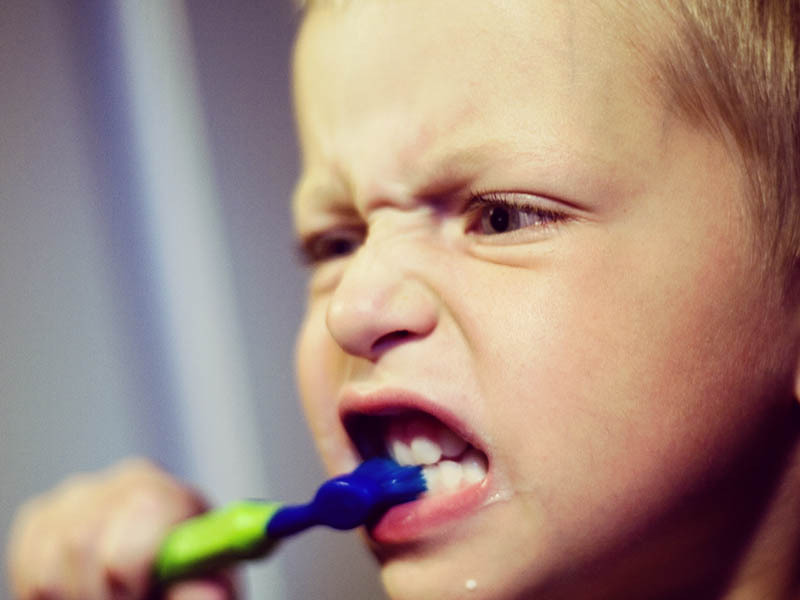 Brushing hard can harm your teeth. If you brush inefficiently or with excessive force, it can cause notches in the teeth that will lead to dentine hypersensitivity. Many patients brush too hard causing severe damage to their teeth. Don’t bear down too hard and use a lighter touch. People need to know that there is such a thing as “too much brushing”. Although bacteria build up in the mouth, mainly after a good snack, brushing immediately afterwards can cause tooth sensitivity. Rinsing well is just about all you need. You can brush 30 minutes after eating. Dentists warn that brushing more than three times a day might not be ideal. Too much brushing can wear down tooth enamel and also damage gums. Our tongue contains the majority of the bacteria in our mouth; from the environment and also from the food and beverages we consume. Bacteria live and breed on the rough surface of our tongue. While brushing our teeth gets rids of the bacteria adhering to the dental enamel, not brushing the tongue will just allow the bacteria on your tongue to transfer to your teeth again after a few hours. Brushing the tongue doesn’t only remove the bacteria hiding in the nooks and crannies of its surface, but it also helps to prevent bad breath. Dr. Hoyt recommends tongue scrapers in order to remove the bacteria and food particles that cause bad breath and help to make your mouth pristine. Always buy soft or ultra-soft brushes to minimize tooth damage. Soft-bristled toothbrushes however, can also cause abrasions if not used correctly. The key is to buy the right brush and follow the proper technique. Also, the toothbrush you use can harbor germs including strep and staph. It is recommended to replace a regular toothbrush every three months or sooner if the bristles get damaged. To minimize the day-to-day growth of germs, rinse your brush with hot water after every use and allow it to fully dry. Many brushes on the market today help to counteract the problems found above such as Sonicare series toothbrushes. They flex in order to prevent harsh brushing and some options include a bacteria-killing UV light chamber for cleaning the brush. Whether you’re rushing to get to work or ready to dive into your bed, dentists recommend brushing for at least two to three minutes. Most people don’t spend nearly enough time brushing their teeth. You can divide your mouth into four sections and spend 30 seconds each. If you brush for too long, remember that it can do more harm than good by damaging your enamel and increasing gum sensitivity. Choosing the best toothpaste can be tricky because there are so many options. First things first, always look for the ADA seal on your toothpaste’s box. It shows that the product is tested, its claims are legitimate and the ingredients are effective. Your preference for pastes or gels, cinnamon or spearmint flavors, has nothing to do with your dentifrice’s effectiveness. Important! If you have sensitive teeth, use a non-whitening toothpaste. The exposed dentin close to the gum-line can become oversensitized by the chemicals in whitening toothpastes. The best options for sensitive teeth are Sensodyne, Pronamel, MI Paste and fluoride treatments. These help to rebuild the enamel in the sensitive areas and make brushing more comfortable. Watch out for Sensodyne and Pronamel with whiteners as these can still cause sensitivity.